This brand new luxury 3 bedroom home with central AC sleeps 8. It is a state of the art home built in 2014 with views of Crystal Lake in Orleans. Direct deeded access to Crystal lake comes with the home through short path down from the property to the water. You won't find another rental like this (new and with high end finishes) on the one and only Crystal lake. There is one Master bedroom on the main floor with king bed and en suite. Also on the main floor there is a half bath with beautiful tiling, open kitchen with a large white marble center island and dining area. Kitchen has all new top of the line appliances and chef's range. The Kitchen and living room both have views of Crystal Lake out the many windows. It is bright and airy. Living room opens to the deck where there is more outside dining and a gas grill. The upstairs houses the second master with King bed with full views of the water. The third bedroom has a queen and twin bunk beds. Each bedroom and the living room have large flat screen Smart TV's that are Amazon, Hulu and Netflix capable. Entire home has speakers that are Sonos capable. Run the music from the touch of a button on your smartphone. Beautiful stonework surrounds the home. Brand new modern outdoor shower is around the back of the home with privacy and a door leading into the main floor hall. Direct deeded access to Crystal lake comes with the home through short path down from the property to the water. This entry to Crystal Lake is unique in that only two houses have access and it is quite sandy and perfect to enter for swimming, kayaking, paddle boarding etc. Head out on the lake throughout the day as the whim strikes you. Or enjoy world renowned Nauset Beach on the Atlantic Ocean under 10 mins away and come home to your lakefront oasis to wash off the salt! NOTES: This home shares a driveway with the recently remodeled 4 bedroom on the lake that Nauset Rental also owns. There is deeded access to Crystal Lake from this home through the yard of the home directly on the lake. The small landing is right in the back yard of the home on the lake. People renting the 4 Bedroom recently Remodeled Home are aware you will have access. Crystal lake is one of the undiscovered gems of Orleans and considered one of the best swimming lakes in all of Cape Cod. Known for its silky-smooth crystal clear water, Crystal Lake is located halfway between Nauset Beach on the Atlantic and Skaket Beach on Cape Cod Bay. No jet skis or gas-powered boats are allowed—and this makes it ideal for swimming, sailing, canoeing, fishing, and lounging. Many who discover Crystal Lake realize that the serenity of its waters are a great compliment to the sometimes overcrowded Nauset and Skaket ocean beaches. Other than eight parking spots available at the small public beach at the southern end of the lake and a boat ramp located at the northern end of the lake, there is no public access to the lake. This house provides private access to the quiet southwestern part of Crystal Lake and is a wonderful relief from having to pack lunch, load the car, and rush to Nauset or Skaket Beach each morning before their parking lots fill-up and close. This one of the few houses on the lake with its own shallow sandy entrance that sometimes recedes to form a small private beach by July. Once you enter the water, there is a gradual 30’ shallow sandy slope that makes it an ideal spot for children to play and for adults to relax in their lounge chairs. This shallow sandy entrance also makes it a very easy spot to launch a stand-up paddleboard or boat, and makes it a great place to stand and catch 12” large-mouth bass in this state-stocked lake. In the morning, you will see swimmers and stand-up paddleboarders traversing the one-half mile long stretch of the lake. During the day, you will see people in sailboats and on rafts and inter-tubes leisurely floating across the lake. During the evening, you will see people kayaks and canoes enjoying the calm waters and sunsets. During night, you will see incredible stars and hear sounds of bullfrogs and loons. The house is close to the Cape Cod Rail Trail, Academy of Performing Arts, less than 10 minutes to Nauset and Skaket Beaches, and a 15-minute walk to the baseball field where the Orleans’ Firebirds play. There is everything you need. The house is clean and absolutely no noise. Chrystal lake is very close and the water is beautiful (warm and clean). I had very good dealings with Nicole and Kent during my stay and with devin after our stay. 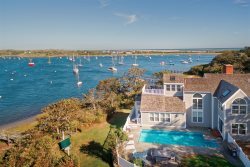 Beautiful home in a wonderful location on one of the nicest little lakes on the cape.